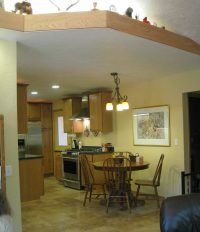 There was no room to expand in this kitchen remodel, and the space was complicated by a drop in floor level at the living room. The solution? 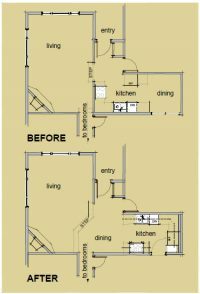 Flip the kitchen and dining area, and elevate the dining room floor to provide more room for a table, while eliminating the down-and-up steps to the bedroom. 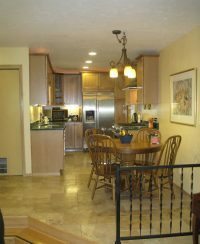 A bonus: the kitchen is no longer in full view from the front door.